Merrimack College senior Chris Barton has signed an ATO with the Bridgeport Sound Tigers of the AHL and could make his professional hockey debut tonight, when the Tigers travel to Portland, Maine to take on the Portland Pirates. 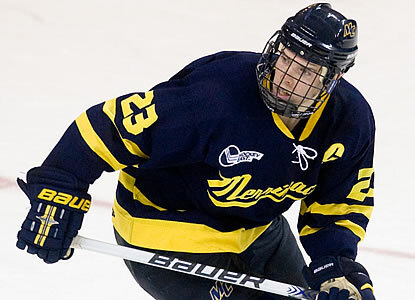 Barton finished the Merrimack season with 39 points (14g-25a) in 36 games and totaled 48 goals and 71 assists (119 points) in 141 career NCAA games. The Calgary native becomes the first member of this year’s Merrimack team to sign a pro contract. He’ll join Joe Perreira (BU) and Tyler McNeely (Northeastern) as fellow Hockey East players this season that have signed with Bridgeport. Best of luck to a huge part of MC's rise and recent success. Good work, Chris! Yeah that's awesome, hopefully we'll see him before the end of the season. Way to go Chris….Jack D will be following you closely….looking for a hat trick! Congrats to Chris! He deserves continued success.